Ten oral histories and three essays: "Buffalo Heads and Sacred Threads: Hmong Culture of Southeast Asian Highlands" by anthropologist Eric Crystal; "Pa Yang: A Personal Treasure" concerning textile arts by folklorist Amy E. Skillman; "Songs of Hmong Women: Virgins, Orphans, Widows and Bards" by ethnomusicologist Amy Catlin. Soft cover, 32 pages, 44 photographs, 5 song translations. 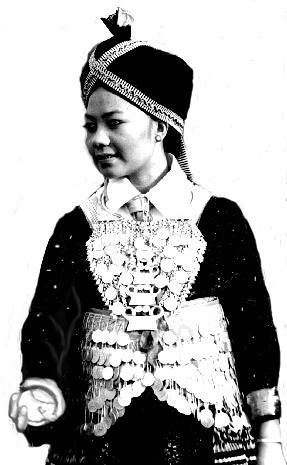 A 60-minute audio cassette recorded in Thailand and the United States, illustrating the article "Songs of Hmong Women" found in the booklet featured above. Included are an Orphan's Song, Daughter-In-Law's Song, Love Song, Widow's Song, Song of Homesickness, and Schooling Song. Additional textual and musical transcriptions of these items are published in Selected Reports in Ethnomusicology, UCLA, Volumes 5 & 9. "In the growing field of ethnic American music studies, gender has been slighted as an important variable. The great value of the cassette under review is that it ties directly into this topic..." -Ethnomusicology (Spring/Summer 1988).